This beach is one of the only Kauai beaches without a Hawaiian name. This beach used to have a large black pot that was used to cook fish for celebrations. This is how it got it’s name. Black Pot Beach is part of the Hanalei Bay beaches and is packed with locals every weekend. You will see tents and tarps setup for picnics, fires and BBQs. Further up from the water, there is a large grass lawn area with picnic tables and shade for relaxing. Behind this grass area there are places you can rent surfboards and stand up paddle boards. The mouth of the Hanalei River feeds into the ocean at this beach. Access to this beach is a breeze as you can drive right up on the beach. Many locals back up their trucks and cars to set up a day camp on the beach. Sunsets at this beach are a popular evening activity. The beautiful backdrop of the pier and the surrounding mountains make it mystical and wonderful. Watching the sun set over the ocean here, is truly amazing. Back your car or truck right up to the ocean, pull out a few chairs and eat dinner, desert or share a drink here. It’s free, and arguably beats the view from any restaurant in the area. Please make sure to keep the beach clean by picking up your trash. Kids love this beach and you’ll see them playing in the water here why their parents socialize and BBQ dinner with other locals. This is mainly a surf break, called Cannons and the beach right in front of it. Cannons Beach is just past Haena Beach Park on Kauai’s north shore. This beach isn’t suitable for swimming but is a popular surfing beach for more experienced surfers. This beach has no facilities, but a short walk to Haena Beach Park, and you will have showers, restrooms and more. You will find very few if anyone on the beach at this spot. The action is in the water. Look careful and when there is surf, you can watch surfers riding the waves on the adjacent break. Really, this is just the strip of sand in front of a popular north shore surf break. Hanakapiai Beach is nestled in the Napali Coast and accessible mainly via the Kalalau Trail. It’s is approximately 2 miles from the start of the Kalalau Trail, however beware it’s not for novice hikers. At the beach you can take another trail to Hanakapiai Falls, a fantastic waterfall or continue on along the famous Kalalau. The trail head for the hike is located at KeÊ»e Beach. Plan to take 1-2 hours each way on this trail. It’s steep, rocky and gorgeous. In the summer this beach usually has plenty of sand, but in the winter waves and high tides wash away the sandy shore line leaving mainly rocks and mud. To reach this beach the trail requires you cross Hanakapiai River, which flows down from Hanakapiai falls, and meets the ocean here. This creates dangerous currents and murky water at times. The beach is remotely located with no road access. The word Hanakapiai means “bay sprinkling food” in Hawaiian. This beach and the surrounding area used to be a fishing and farming area at one time. The natural geography makes Hanakapiai conditions even more hazardous; in the event that one gets caught in a rip current (or otherwise swept out to sea) the nearest safe shore area is approximately six miles away. The currents in the region are so powerful that the bodies of at least 15 drowning victims have yet to be recovered. It’s simply not recommended to do anything that involves getting in the water at this beach. If you must get in the water (maybe after a long hot hike) do so in the small, calm pools in the Hanakapiai stream. The water is usually clear and slow moving, however it can be a bit chilly. If the water is murky, this is a sign of flooding and you should stay clear of the river. Flash flooding can happen without notice nearly anytime of the year, if a enough rain come down upstream. So keep an eye out for flash floods when near the river! According to a sign posted on the beach, as of 2008 at least 83 people have drowned at Hanakapiai. Another less lethal hazard is the fresh water. As in all of Kauai, make sure to treat any drinking water you get from the stream, falls or river before consuming. When you get to the beach you will notice a large crescent (300 foot) shaped golden sand shore separated by a large rock outcropping. It’s rarely crowded and is a great place to spot sea turtles. Snorkeling is best when the tide is in a little, otherwise is can be shallow in places. When the tide is in this beach gets smaller, and waves can be large. If you want to visit this beach but would rather not hike the steep trail, you can kayak from Hanelai Bay either on your own or in a guided tour. You will see these kayakers land around lunch time nearly every day. They snorkel and spend time on the beach. Some expert swimmers take the trail down and swim over and around the point to the Hanalei Bay beach of Pu’u Poa. You may also find swimmers coming the reverse way from Pu’u Poa. On the trail to the beach you may want some insect repellent as there are mosquitoes certain times of the year. You can’t hike, boat or drive to this beach! Swimming is your only means of access. The swim to this beach is not easy feat. We recommend you wear fins and only attempt when surf is low. High surf brings dangerous rip tides and crashing ocean waves. Currents may make the journey easier one way than the other, so be wary if your swim seems easier that expected. It may not be so easy on the way back. Look for large arched sea cliffs with a waterfall as you swim to identify this beach. If you are more of a rock hopper, at certain times you can walk over from Kalalau Beach. Because of the spiritual history and ceremonial grounds, no boats (kayaks included), airplanes, or other surf devices are allow on the beach. However you can boat near by and swim the final stretch. This beach also known as Kahili Beach or Rock Quarry Beach, is easily identifiable because of the nearby Kilauea River and rock quarry. It’s no longer a working quarry, but is still fun to explore. The beach has a large calm area which is great for swimming, but can be a bit murky. Opposite the pool is a good snorkeling spot. This beach can be a popular surfing and body boarding spot when the surf is up. If the water is murky, though, you want to avoid it as sharks and rip tides have been know to occur at this time. This beach is the ocean side of the Kilauea Bay. The Bay is calm and a nice fresh water spot to rinse off after riding some waves. Kids also like to play in the water. You may see people fishing right at the mouth of the river and occasionally you will see people day camping (however camping is not permitted per posted signs). The stream hits a sand bar as it reaches the sea and forms a large pool good for swimming and fishing, when the water is calm and clear. At the parking lot you can also launch for a Kayak trip up the Kilauea Stream. It’s calm and a nice easy short paddle. For more privacy you can hike to the right of this beach over a small rock outcropping to a small secluded sandy beach. It’s a short walk for some nice privacy, however the water in this area can be less safe when surf is up. This ironwood tree-lined crescent shaped beach has plenty of parking and is easy to find. It’s located at the mouth of the freshwater Kalihiwai Stream. As you approach the beach you’ll catch a glimpse of Kalihiwai Bay from the road. This narrow and steep road gives you a view of the white sandy beach, which is situated between lava cliffs on either side. You’ll see the mouth of the stream on the far end. Water is generally calm and the sand is great and voluminousness. In the winter this beach is great for surfing and body boarding however the waves can be dangerous and is considered an expert surf break. The shore break can be dangerous in the winter, so stay out of the water, and away from the river mouth wither strong currents can form. The waves here are known to rise very slowly and break in long, even crest over a sloping sandy bottom. This makes wave jumping and body boarding desirable. The popular surf break in the winter is under the cliff area, however waves can be large and powerful here. In the summer this can be a good beach for swimming, even for children (depending on conditions). Kids will also love the brackish pools behind the beach, near the stream for wading, swimming, floating and fishing. Families love to let the kids play in the calm bay when tide is low. When the bay gets deeper, it’s a prefect sending off point for a short and relaxing kayak trip. A great beach for a picnic lunch with lots of shade, easy access and usually it’s not real crowded. No hiking required, just pull up and unload on the beach. Also on the other side of the beach is the Kalihiwai Stream, which is great for paddle boarding, swimming and playing the water. You can launch a kayak and paddle upstream unless there has been recent flooding or heavy rains. We indicated restrooms, however they are just portable toliets. The nearest “real” bathroom is a the ball field behind the Kilauea Market. While you are there, grab some Ahi Tuna wraps to go from the Kilaeau Fish Market, they make a quick and tasty lunch on the beach. At times you will see local dogs from nearby houses on this beach, so watch your step. Ke’e Beach is one of the most visited beaches on Kauai. It’s located at the north end of the island where the highway ends and in fact is the last beach accessible by car on the north shore. So it’s literally located at the end of the road. The famed 11 mile gorgeous and treacherous Kalalau Trail begins at the western end of the beach. Ke’e’s gentle ocean lagoon is best utilized in the calm ocean conditions of the summer. Several movies and min-series have been filmed here such as The Thorn Birds and Castaway Cowboys. A view of the entire Na Pali coast stretches westwards from this point. From this beach, you can also start the 4 mile round trip hike to Hanakapiai Beach. Ke’e’s inviting lagoon is teaming with fish and perfect for snokeling. Beware, however of the Puka Ulua, an opening on he left side from the lagoon to the sea. Currents can be very strong here,especially in the winter. People often fish for the large, prized Ulua fish in this area. On calm days, we have found that just outside the inner reef is the best place to swim with turtles, schools of tuna and other exotic fish. It’s very shallow getting out to this spot, depending on the tide, but once you are there, it drops into a nice lagoon, with fish and underwater amazement. It’s usually just past the crashing waves of the inner reef. Either swim carefully in shallow water, or carefully take a channel out from the lifeguard area. We have found that the masses of snorkelers are looking at murky sandy water, that is usually containing more white legs than fish. If you want real snorkeling, find the lagoon. To get a visual on the spot we are talking about hike up the Kalalau Trail to a lookout point, and you’ll see. Or use the map satellite and photos we have posted here. Again, beware of dangerous currents that will take you down the west side and out to sea! To the south of the beach, or to the right (clockwise on the island), you will find a less swimmable, but more stunning view of the coast and a less crowded section of the beach. It is generally too shallow to swim here, but it’s far less crowded and gorgeous. Just hike behind the shower and bathrooms, and cut through the old parking lot (dirt area with lots of trees). It’s easier than hiking along the beach. Each night you will find a small gathering of sunset watchers at this beach. If you value watching the sun disappear into the ocean, surrounded by blazing oranges and reds, this is your beach. Check for sunset times, and head out. Many times by sunset, parking can be found in the main lot (which is normally as common as winning the lottery). Parking is usually hard to find at this beach. You used to be able to park in a undefined dirt lot in a grove of trees. But this is no longer allowed. There is a small lot, however it doesn’t hold very many cars. You can park along the road in a few spots, but most are not permitted. As of 2012 a parking ticket is only $35, and you will see dozens of cars with tickets every day along the side of the road. Getting to the beach early helps, for example in the summer around 7-8 AM there are usually plenty of parking spots. There is also a dirt lot (or a mud pit if it’s wet) just before you get to the beach on the right. This is a bit like the wild west since there not marked spots or exit routes. However it’s a good place to find a spot. A path also leads to the ocean, or you can walk along the road to the main beach. This bay is where the Kilauea stream meets the ocean. The beach here is Kahili Beach and is a poplar surfing spot. The bay is calm and a good fishing or kayaking spot. The stream has a slow current, and many times the wind will blow you up or downstream. This beach is just adjacent to Hideaways Beach. Sometimes Pali Ke Kua and Hideaways are considered the same beach, but access is separate unless you swim, so we consider these two small but separate beaches. Hideaways Beach is accessed via a small, steep but public trail whereas Pali Ke Kua Beach is only accessed by a private paved path starting between Building 1 and 3 in the Pali Ke Kua community. Above this beach you is a lookout. It’s a grassy spot with a few benches and railing, that overlook the beach and cliffs below. It’s a great spot to watch the sunset, scope out your snorkel spots, or just enjoy the view of the ocean and the lush mountains behind. This beach is small, and has very few sandy spots. When tide is high, no sand may be available, just large black rocks. However when the ocean is safe and tide is in, you will find a good spot for snorkeling. You may find good snorkeling here, depending on the tide level and roughness of the ocean. There are plenty of channels to swim in and out of just beware of rapidly changing depths. You’d hate to be beached on a rock, then smashed into it by a big wave or set of waves. So be mindful of the depth of this area, and the size of the waves. Be sure to wear good shoes or sandals, as the trail down the beach may be paved, but is not easy. It also means you will be on private property. So if you are not a guest of the Pali Ke Kua Beach, you are not allowed. However, you can be the judge of your own decisions. Packing light is a good idea, as carrying anything down the long and steep path may be difficult, but carrying it back up after a day in the sun may be the real challenge. Pilaa Beach is a sparsely visited beach. It is difficult to access and since the nearshore ocean bottom is rocky, it’s not a good beach for swimming. The beach is a good spot to just relax without the crowds, but since the trail to it is rocky, it’s even challenging to bring a picnic basket. This beach is actually two sections of sand divided by a rocky point. The eastern section is protected somewhat by Kepuhi Point. A stream crosses the western section of sand. A wide reef extends from Kephuhi Point to Kilauea Bay, two miles to the west. During calm conditions, the western section has a couple of sandy bottom areas that are good for swimming. The outer section of the reef has a channel that is a major drainage point for the reef. A powerful rip current runs through this channel during periods of high surf. It is visible from the access trail on the hill to the west. The reef in front of Pilaâ€˜a and the rocky shoreline west of the beach is popular with experienced snorkelers and spearfishers. The property behind Pilaa is privately owned and there is no direct right-of-way to the beach. Both pockets of sand can be seen from the hill to the west. A trail from the base of the hill leads over the rocky shoreline to the west section of the beach. The trail drops 180 feet in elevation and is about a half mile long. Pu’u Poa Beach is mainly used by guests of the St. Regis Princeville Resort and the Hanalei Bay Resort. Hanalei Bay Resort guests can take the steep and paved path that leads to the beach (or use the resort’s shuttle). Guests of the St. Regis Princeville Resort can take the elevator to the ground level and you are there! If you’re not a guest at either one of the two resorts, you take the almost 200 steps that start near the public parking lot. This public lot is located near the entrance of the St. Regis Princeville Resort on the right. Pu’u Poa Beach is the longest beach near the St. Regis Resort as it extends from the hotel all the way down to the Hanalei River. When the tide is low, a sandbar appears extending from the river to Black Pot Beach. You will most likely see swarms of snorkelers out and about, however, we haven’t had good luck at this beach. It’s usually very shallow in summer months, and leaves little room for fish or aquatic life to see. 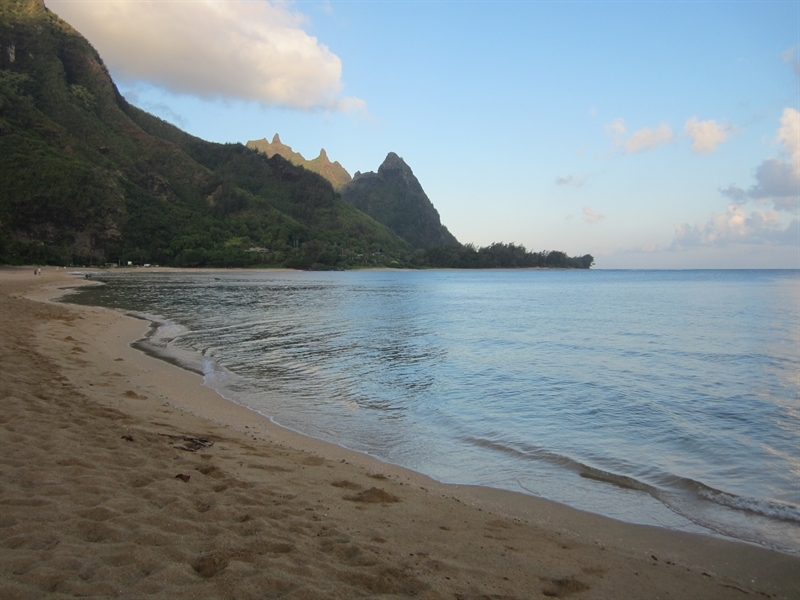 If you get further out, you may have better luck, but beware the currents of Hanalei Bay. Since it’s shallow and near the mouth of the Hanalei River, it can be pretty murky. The view from this beach is hard to beat. Looking over the famous Bali Hai point and lush mountains just doesn’t get old. You can also rent paddle boards, and other surf apparatus from the St. Regis staff by the pool. An offshore reef protects the beach, making it generally safe for swimming. The reef, however, is not enough barrier for the beach from winter swells. During winter international surfers flock to Pu’u Poa Beach. The ocean water that breaks against the outer edge of the reef close to Hanalei River provides some of the best surf rides on Kauai. Queens Bath is named after the mother of Prince Albert, which is where the Kauai city of Princeville gets its name. This interesting pool is worth the steep and sometimes treacherous trip to see it. The path drops roughly 100 feet as you decent down to the coast. You’ll need to hike down the overgrown red dirt trail to cove. On the way down, take note of the waterfall to the right, a perfect resting point to cool off on the return climb back up. Along the path to Queen’s bath you’ll see interesting rocks in the associated stream. There are many spots along this trail to stop and take pictures of the waterfall and the stream. Because Queen’s bath has become so popular expect to run across other people along the path. Also, make sure you’re wearing good footwear. Bare feet or aqua socks won’t provide enough support as you walk across the lava rock to Queen’s bath. When the trail opens at the bottom of the bluff the cove in front of you is a great spot to watch sea turtles in the surf. The reef area is coated with algae which draws the turtles to the cove. From this cove, go left and carefully negotiate the lava rock roughly 250 yards to find Queen’s Bath. The views of the ocean and the rocky shoreline here are excellent and even with calm surf, you’ll see waves crash on the rocks shooting spray high into the air. Sea Lodge Beach is calm and fairly private, and is also known as Kaweonui Beach. Getting here requires about a half mile hike through a moderate and sometimes slippery trail. It’s well worth the short hike. This beach has great sand, shade and calm water. Large Hala and Kamane trees offer great shade and this beach is usually not crowded, due to limited parking. Swimming is difficult when tide is low. Most of the beach is protected by a inner reef, which can be sharp and hard to navigate. If tide is low there may only be a few channels that you can swim or snorkel in. When tide is high, this beach practically disappears. A rocky reef provides a break from the open ocean, and provides decent snorkeling. Make sure to bring inspect repellent as sometimes of the year you may have mosquitoes. Their is a surf break that can be seen from this beach. This break is known as Little Glass Shacks. The post-card scenery of Tunnels Beach offers a wide crescent shaped golden sand beach, shady ironwood trees and views of the Bali Hai and lush jungle mountains. This beach boasts a grove of ironwood trees providing comfortable shade for your visit, golden, soft sand and spectacular views at the edge of the Na Pali coast. Also, while a popular spot with both tourists and locals, the beach is not overly crowded and you can always find a spot distanced from other beach goers. The sunsets are also spectacular. The center portion of beach has a huge is a half moon shape with a large reef about 1/8 mile off shore. 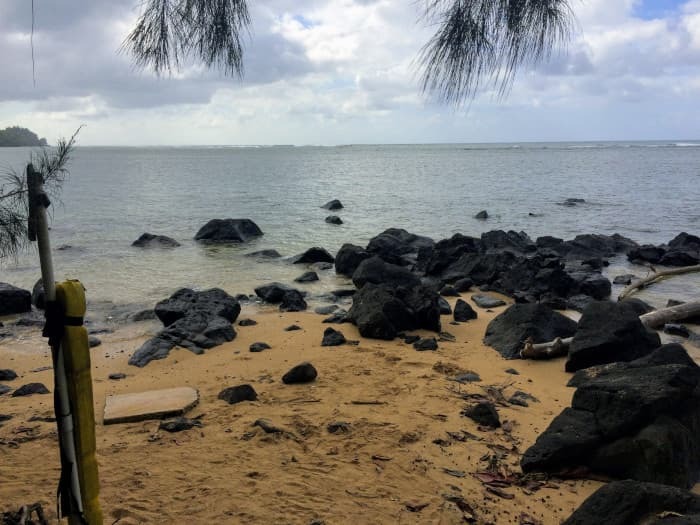 This reef provides for excellent snorkeling and diving and creates a barrier from the rough surf conditions and strong currents characteristic of the North Shore. The shallow, sandy bottom in front of the reef remains calm even in the rough winter months and the waves breaking beyond the reef makes for an an excellent surfing spot. Tunnels is renowned as not only one of the best dive spots in Hawaii, but also as one of the premier dive sites in the world. Composed of an inner and outer reef with a wide channel in between, Tunnels is a maze of coral formations, lave tubes, tunnels and arches and is home to thousands of different species of marine life. Divers tend to favor the outer reef, which offers more lava tubes and arches. If you aren’t scuba certified, you can still check out some of the amazing coral and marine life at this beach. While you may not get to explore some of the underwater tunnels without a tank on, you’ll still be able to take in the underwater beauty of this reef. Enter the water at the sandy spot on the northern part of the reef. The wide sand beach offers the easiest entrance into the water. Don’t attempt to enter the shallow areas where there are rocks and reef that come all the way up to the beach edge. Large and small Lava tubes form the many underwater caverns give Tunnels it’s name as well as a magical underwater world to explore. If you’re a beginner at snorkeling, then you should stay close to shore and follow the inner reef. The inner reef may not be as fun as the outer reef, but it does have lots of caverns, channels and tunnels. Only experienced snorkelers should swim to the outer reef and even that depends on the water conditions. The outer reef is by far the most interesting. In some places it has a steep drop-off of about 50-70 feet with an abundance of sea life. Past the outer reef the surf kicks up, making Tunnels popular with both surfers and kite boarders. Lot’s of Sea Turtles can be found at this small cove next to Queen’s Bath. Low tide is best for maximum turtle viewing! It’s not uncommon to see 100+ turtles, fitting in the current to eat, and stay off the rocks. There is a waterfall that flows into the ocean, and creates a good area for turtles to feed and a safe haven from predators. Be careful as when the surf is high, large waves crash on the rocks here. Keep your eyes on the ocean as well as on the turtles. Wainiha Beach Park is known for it’s year round lack of swimming. In face Wainiha means “unfriendly waters”. This beach has no reef and it’s simply too dangerous for most activities. However there is more to do at this beach than swim. Located in Haena, this beach has coconut trees, pineapple and more just steps up the beach. It’s also lined with upscale houses and private estates. The sand can be very course in some areas. Located at the mouth of the Wainiha River, this beach is generally murky and the surf is very hazardous. Nearby Hanalei Colony Resort has a restaurant and coffee shop. Grab a coffee and go for a beach stroll. 3 beds + 3 baths + sqft. This beach is really just the other side of Anini Beach, separated by a small stream. If you drive until the road ends, you will see this beach just past the river mouth. However you usually have to ford the small stream to get to this small patch of sand. Those in Princeville can hike or drive down a step road (Wyllie Road) to get to the other side of this beach. It’s usually private, since access is limited. Water can be murky following rains. However, the easiest way to find this beach without fording the small stream, is to park at the Public Beach Access lot at the Westin Resort in Princeville. Here you will find near the edge of the golf course a trail head that leads through the dense foliage and down to the water. You may find other camping down near the ocean along a very private portion of the north shore.